Two shows that start this month will feature Wayne Community College student art. A reception to open an exhibition at the Maxwell Regional Agricultural and Convention Center will be held 6-8 p.m. on Wednesday, Nov. 7. It is free and open to the public. Around 50 paintings, drawings, and design pieces created by WCC Fine Arts students will grace The Maxwell Center Gallery Wall. 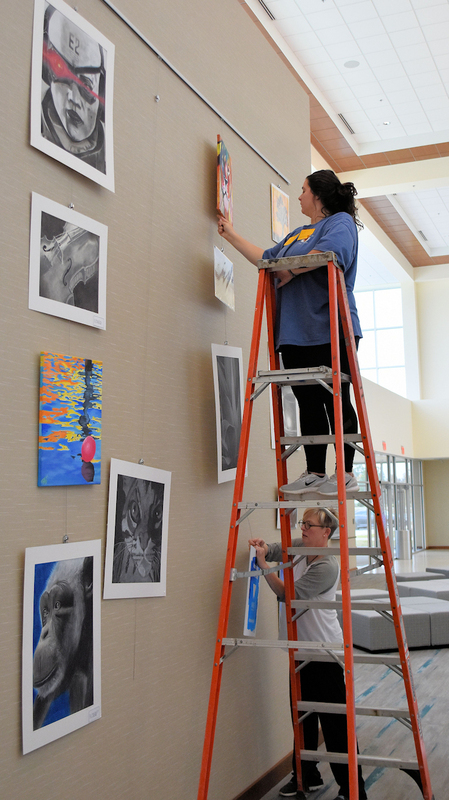 Art Instructor Angie Waller (bottom) and student Madolyn “Gracie” Casey arrange artwork that is part of an exhibition at the Maxwell Regional Agricultural and Convention Center. Prints of student works will be interspersed with original art work and are available for purchase. Proceeds will go to the Fine Arts Fund of the Foundation of Wayne Community College. “If they see an original piece they like that isn’t already a print, we can make one for them. They can just ask,” Art Instructor Angie Waller said. The show will run through March 2019. It is open to the public Monday through Friday, 8 a.m.-5 p.m.
Art will be rotated with new pieces created in the Spring semester and an exhibition that will be held simultaneously at the Arts Council of Wayne County’s main gallery in downtown Goldsboro. A floating reception to kick off the Arts Council exhibit is scheduled for 10 a.m.-3 p.m. on Saturday, Nov. 17. The exhibition will run through Nov. 30. For more information on these shows or the Fine Arts program at WCC, contact Waller at (919) 739-6843 or arwaller@waynecc.edu.